Great Plant Escape - What Is a Bulb? 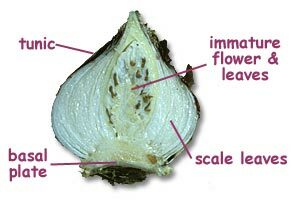 A bulb is next year's plant neatly packaged and surrounded by scale leaves, immature leaves, flower stems, and sometimes even flower buds. The whole bulb is neatly wrapped in a papery brown tunic. Write down what you think are bulbs. Then click here to check your list with the bulbs Sprout discovered!